The Decimal Classification introduced the concepts of relative location and relative index which allow new books to be added to a library in their appropriate location based on subject. Libraries previously had given books permanent shelf locations that were related to the order of acquisition rather than topic. The classification's notation makes use of three-digit Arabic numerals for main classes, with fractional decimals allowing expansion for further detail. Using Arabic numerals for symbols, it is flexible to the degree that numbers can be expanded in linear fashion to cover special aspects of general subjects. A library assigns a classification number that unambiguously locates a particular volume in a position relative to other books in the library, on the basis of its subject. The number makes it possible to find any book and to return it to its proper place on the library shelves. [notes 1] The classification system is used in 200,000 libraries in at least 135 countries. The second edition of the Dewey Decimal system, published in 1885 with the title Decimal Classification and Relativ Index for arranging, cataloging, and indexing public and private libraries and for pamflets, clippings, notes, scrap books, index rerums, etc.,[notes 2] comprised 314 pages, with 10,000 index entries. 500 copies were produced. Editions 3–14, published between 1888 and 1942, used a variant of this same title. Dewey modified and expanded his system considerably for the second edition. 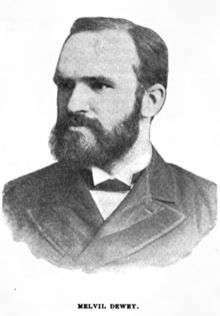 In an introduction to that edition Dewey states that "nearly 100 persons hav [spelling of "have" per English-language spelling reform, which Dewey championed] contributed criticisms and suggestions". The growth of the classification to date had led to significant criticism from medium and large libraries which were too large to use the abridged edition but found the full classification overwhelming. Dewey had intended issuing the classification in three editions: the library edition, which would be the fullest edition; the bibliographic edition, in English and French, which was to be used for the organization of bibliographies rather than of books on the shelf; and the abridged edition. In 1933, the bibliographic edition became the Universal Decimal Classification, which left the library and abridged versions as the formal Dewey Decimal Classification editions. The 15th edition, edited by Milton Ferguson, implemented the growing concept of the "standard edition", designed for the majority of general libraries but not attempting to satisfy the needs of the very largest or of special libraries. It also reduced the size of the Dewey system by over half, from 1,900 to 700 pages, a revision so radical that Ferguson was removed from the editorship for the next edition. The 16th and 17th editions, under the editorship of the Library of Congress, grew again to two volumes. However, by now, the Dewey Decimal system had established itself as a classification for general libraries, with the Library of Congress Classification having gained acceptance for large research libraries. ↑ Consider as an example a book on the network protocol IPv6. It will be located at 004.62, after general networking books (004.6). The shelf location is thus defined. ↑ Note that the title makes use of Dewey's "reformed spelling" in some areas. ↑ Chapter 17 in Joudrey, Daniel N.; Taylor, Arlene G.; Miller, David P. (2015). Introduction to Cataloging and Classification (11th ed.). Santa Barbara, CA: Libraries Unlimited/ABC-CLIO. ISBN 978-1-59884-856-4. ↑ "Dewey decimal classification and relative index (1971)". Internet Archive. Retrieved 14 December 2013. 1 2 3 "Timeline". OCLC. Retrieved 8 December 2013. ↑ "Cutter Classification". Forbes Library Subject Guides. Forbes Library. Retrieved 15 December 2013. ↑ Trotter, Ross (6 July 1995). "Electronic Dewey: The CD-ROM Version of the Dewey Decimal Classification". Cataloging & Classification Quarterly. 19 (3-4): 213–234. doi:10.1300/J104v19n03_17. Retrieved 15 December 2013. ↑ Majumder, Apurba Jyoti; Gautam Sarma. "Webdewey: The Dewey Decimal Classification in The Web" (PDF). INFLIBNET Centre, Ahmedabad, Planner 2007 [held at Gauhati University]. Retrieved 15 December 2013. ↑ Mitchell, Joan (24 January 2013). "Michael Panzer named Editor-in-Chief of the Dewey Decimal Classification system". OCLC Press Release. Retrieved 17 November 2013. ↑ Dewey, Melvil (1922). Decimal classification and relative index for libraries and personal use .. Lake Placid Club, N.Y: Forest press. p. 2. OCLC 1367992. ↑ Luo, Michael (September 23, 2003). "Where Did Dewey File Those Law Books?". The New York Times. Retrieved 17 November 2013. ↑ "OCLC and The Library Hotel settle trademark complaint". Library Technology Guides. October 24, 2003. ↑ "Latest versions". OCLC. Retrieved 8 December 2013. ↑ "Updates". OCLC. Retrieved 8 December 2013. ↑ "Dewey Web Services". OCLC. Retrieved 8 December 2013. ↑ "Dewey Decimal Classification/Linked Data". OCLC. Retrieved 8 December 2013. ↑ "Abridged". OCLC. 2012. Retrieved 23 January 2013. 1 2 OCLC. "Introduction to the Dewey Decimal Classification". Retrieved 8 December 2013. 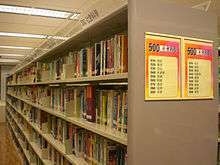 ↑ "A Brief Introduction to the Dewey Decimal Classification". OCLC. Retrieved 16 November 2013. ↑ Taylor, Insup; Wang Guizhi. "Library Systems in East Asia". McLuhan Studies. Retrieved 16 November 2013. ↑ Kaplan, Tali Balas. "Done with Dewey". ALSC. Retrieved 15 December 2013. ↑ Fandino, Marta (2008). "UDC or DDC: a note about the suitable choice for the National Library of Liechtenstein" (PDF). Extensions and Corrections to the UDC. Retrieved 15 December 2013. 1 2 Clarke, Rachel Ivy (May 7, 2013). "Picturing Classification The Evolution and Use of Alternative Classification in Dutch Public Libraries". Public Libraries Online. Retrieved 15 December 2013. ↑ Fister, Barbara (October 1, 2009). "In the search for better browsability, librarians are putting Dewey in a different class". The Library Journal. Retrieved 9 February 2014. ↑ McCarthy, Laena (January 2009). "New Classification System for Public Libraries?". The Public Library Association Blog. Retrieved 15 December 2013. Wikimedia Commons has media related to Dewey Decimal System.